Jewish Lights Publishing, 9781580235068, 30pp. "Standing UP " "Lying DOWN "
What were the people to do? They decided to ask the rabbi of the town. "What are we to do?" they asked. "Shall we put the mezuzah standing up or lying down?" The townspeople have mezuzahs but cannot agree on how to put them up on their doorways. Should they place them horizontally or vertically, standing up or lying down? To end their arguing, they consult the wise rabbi of the town, who advises them to carefully read the Shema in the mezuzah to find the answer. 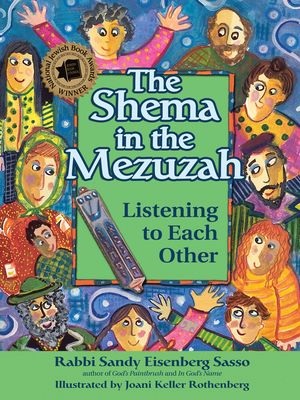 With this lively tale, based on a twelfth-century rabbinic debate, best-selling, award-winning children's author Sandy Eisenberg Sasso helps young people discover that there is often more than one solution to a problem, and that living together and creating "home" requires cooperation and listening to one another.